Sorry for this interuption but I have been getting swamped with emails regarding Noel's Kits. Anyone interested in taking a look you can find her here. 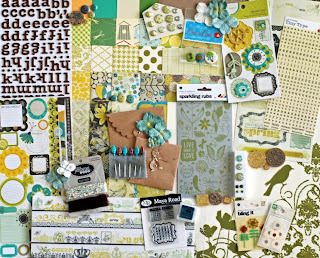 And you're in luck because she just put the April kit (Sonoma County) up for Pre-Order. Below is a pic of the newest kit. I get these kits and I can tell you they are packed to the gills with loads of stuff. So you will see lots of my layouts done with these kits. Back to our regularly scheduled challenge. See post below. I love these kits, I've been eyeballin these for a while now.